Seeking Refuge explores how conservationists and wildlife managers carved out refuges in the North American West to sustain migratory birds. By the early twentieth century, Americans and Canadians had drained or filled many of the wetlands these birds needed to survive. Conserving them required a continent-wide effort to create a network of protected areas in West Coast states and provinces. At the center of these efforts was the U.S. Fish and Wildlife Service, America’s leading wildlife protection agency. It created and managed wildlife refuges amid the industrial, irrigated landscapes of California and Oregon. In doing so, the agency often battled farmers and the U.S. Bureau of Reclamation to obtain the vital water necessary to sustain habitat on which birds depended. 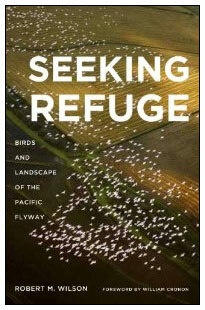 Seeking Refuge is one of the first books to explore the history of these refuges and their role in protecting migratory birds. It examines how the migration of North American birds, one of the continent’s great natural spectacles, depends on the intensive management of refuges embedded within working landscapes of farms and cities. If wildlife are to survive, they will increasingly do so less in remote sites far from people but in these sorts of places. Their fate will depend on fostering landscapes where people and animals can thrive.